Yoga is ultimately about breathing, so it might be difficult to imagine living a life constantly holding your breath. Yet, when you are living under the overbearing shadow of an abusive relationship, you do not breathe. You live like a caged animal, petrified, detached from your body, and separated from your true self. Your abuser becomes your only reference, your only reality. Yoga is ultimately about breathing, so it might be difficult to imagine living a life constantly holding your breath. This is who I was once. I was a lost soul with a broken heart, and I struggled in silence, not only too ashamed to talk about my past but also too ashamed to think about it. I pretended the abuse never happened and I kept living my life in sorrow, hoping that one day I could simply stop feeling so ashamed and depressed. What I did not understand back then was that living in denial was affecting not just my soul, but my body as well. I started to suffer from eating disorders, insomnia, and severe panic attacks. I was constantly sick and in pain. My neck, my lower back, and my legs were always sore. I remember waking up every morning without any strength in my body and going to sleep at night suffering from terrible headaches. In one year, I had sinus infections, the flu, pneumonia, and shingles. It was one illness after another. On top of that, I kept gaining weight, despite the endless hours I spent working out. I was drained and exhausted, mentally and physically. One day, after a terrible fight with my ex-partner, I found myself wandering around the city and saw a yoga studio. I decided to walk into that studio and take a class, without really knowing what I was doing. I wanted to shut my mind, if only for a couple of hours, and escape the life I was trapped in. And it worked. That day was the beginning of my path of healing. The practice of yoga is an excellent survival tool. It helps domestic violence victims heal through the pain, work through their deepest fears, accept their vulnerability, and find a new path toward self-love and non-judgment. 1.3 million women and 835,000 men annually are physically assaulted by an intimate partner in the United States, reports the National Institute of Justice. And according to Safe Horizon, the largest victims’ services agency in the United States, one in four women will experience domestic violence in their lifetime. I learned on my own skin that the effects of domestic violence often lead to anxiety, sleep disturbances, eating disorders, and isolation. Yoga helps to heal both spirit and body, as well as a broken heart. It teaches students how to connect to their bodies, to become more in touch with their emotions, and more mindful of their thoughts. This is significant, especially for those who have created a habit of detaching from their bodies. Victims often do not listen to their feelings because, for years, they learned to numb themselves and pretend that everything was fine. Yoga helps a person to develop focus and strength of mind, which can empower victims to make the choice to take control over their lives and leave their abusers. And yoga practice can provide a safe space and community for those who have been abused to explore their vulnerability, to feel exposed and fragile, and to accept—and even embrace—that susceptibility, that openness, without feelings of shame or judgment. Yoga helps to heal both spirit and body, as well as a broken heart. During asana, in particular, you learn the important art of “listening to the body.” Movements are joined with the breath, which calms the nervous system enough so that you can begin to feel present. Safe and present are two requisites to healing. Asana also assists the body in releasing trauma. For example, the hip region is known to hold past traumas and emotions, so practicing hip-opening asanas helps release old energy connected to the past and to reconnect to the core of your strength, your fragility. It also teaches you how to accept your body when you cannot achieve a pose, and it allows you to discover how much space exists in your body by encouraging the slow release of tension at every exhale. Pranayama, too, assists in relaxing the body by releasing anxiety and calming the mind. Sometimes your yoga studio can become your safe place. A place where you can find stillness within yourself, even if everything around you is not peaceful. In order to connect with your true self, you have to allow yourself to disconnect from the anxiety of an uncertain future and the pain of a turbulent past. So, walk into your favorite studio (or find one to try out), roll out your mat, and find child's pose or a comfortable seated position. Inhale slowly and, on the exhale, just touch the floor. Be aware of that touch. Connect to Mother Earth, set your roots, find your foundation, and bloom into every asana. Take all the time you need to recognize the essence of the earth element and embrace its grounding power. You just have to find the courage to embrace your scars, vulnerabilities, and darknesses, and never be ashamed of them. Instead, let them become the basis of your strength. Every inhale and every exhale in your practice is a gift, an opportunity to calm your mind and let go of anything that you do not need, both in your body and your mind—including coping mechanisms that once served as forms of protection. When you begin your practice, listen to what your physical body is trying to tell you. Instead of using your emotions to fight against the message, surrender to it. You hold all the answers to your questions in your heart. You just have to find the courage to embrace your scars, vulnerabilities, and darknesses, and never be ashamed of them. Instead, let them become the basis of your strength. Yoga taught me that I could heal. I could understand how to cope with my past and lovingly accept everything I was: light and dark, sun and moon, earth and water, all in one. Yoga is a practice intended to bring union to the practitioner. When I started to let go of the past, I was able to understand my power. And by surrendering to the moment, I found the ability to forgive myself and others. I decided to dedicate myself to help those who are still living under the oppression of violence through (what for me are) the twin paths of yoga and art. Inspired by the cycle of the moon, I hoped to create an environment in which we could all raise our voices against violence, a place where we could sing our song and say no to it, if needed; where we could use our body to dance the symphony of life. And so I did. 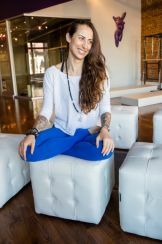 Ode to the Moon, a fundraiser yoga event, was born from my personal battle against the silence that surrounds domestic violence, and is my attempt to use yoga and music to heal the souls of those who are suffering. Because violence is never an answer. Love is. Practice compassion and love for others, but more then anything, practice them with yourself. Do not fear your past. Instead, make it the core of your strength and live your life with an open heart, trusting in love. is a native of Milan, Italy.